Security forces yesterday raided the enclave of the radical Boko Haram sect in Maiduguri, in an all-out attempt to crush the group whose supporters ignited violence in five states in which more than 150 persons including security personnel died. The army moved in six light armoured war tanks and deployed hundreds of heavily armed soldiers, mobile policemen and regular policemen around Maiduguri to destroy the residence of the sect leader, Malam Muhammad Yusuf, which also serves as the group's headquarters. The security forces also cordoned off old Maiduguri, Galadima, Kasuwan Shanu and Low Cost areas, which have been under the control of the sect members since Sunday night when the crises began. The military action came a day after more than 100 people were killed in Borno, Yobe and Kano states in gun battles between the sect's followers and security forces. Earlier on Sunday, more than 50 persons were killed in Bauchi, following at attack on a police station by the sect's followers in retaliation for the arrests of their leaders. 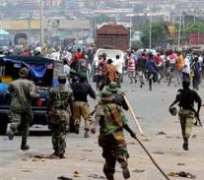 Most of the dead were members of the sect, while many police, soldiers and prison personnel also died in the clashes. Yesterday, the violence spread to Katsina State, where the sect's followers attacked a police station in Danja injuring a policeman. The Boko Haram sect is opposed to the western education and propagates a wholesale adoption of Islamic law across the country. It is made up of mainly university dropouts. Yesterday's offensive in Maiduguri, which started in evening, was being led by the GOC, 3 Armoured Division of the Nigerian Army, Jos, Major General Saleh Maina. It is coming on the orders of President Umaru Yar'adua, who said yesterday in Abuja that his administration would no longer tolerate any armed insurrection in any part of the country. The military ordered residents to evacuate the affected areas and as at 5:30 pm, sounds of explosions were being heard and thick smoke was billowing into the sky. It was not clear last night how the shelling went and there was no official statement. Security sources said leader of the sect in Kano was killed while he was about to enter Maiduguri to bring reinforcement to his members. Streets of Maiduguri remained deserted yesterday as very few cars moved around. Residents were seen in front of their homes speaking in small groups. The National Emergency Management Agency (NEMA) said over 4,000 persons took refuge at different military and police quarters. Assistant Zonal Coordinator of the agency in the Northeast Apollos Jediel said of the displaced residents, 3,000 persons were taking refuge at the Maimalari Military Barracks, 600 were at the state police headquarters while 19 were at the Giwa Military Barracks. He said the agency ordered release of relief materials, mostly food items and beddings, which he handed over to the Borno State Government for distribution to the victims. Spokesman for the Borno police command Isa Azare yesterday confirmed that 90 of the rioters as well as eight police officers, three prison officials and two soldiers had been killed in clashes with the security forces on Monday. Speaking to newsmen at the Nnamdi Azikwe International Airport shortly before he jetted out to Brazil on a three-day visit, Yar'adua said he had asked security agencies to deal “squarely and promptly” with the leader of the Boko Haram sect and end the crisis by yesterday evening. The president said security agencies launched a pre-emptive strike on the sect, contrary to widely held opinion that members of the group first attacked the police. “What has happened is that it is the government that has moved to nip in the bud the action of a potentially dangerous people. These people have been organising, penetrating our society procuring arms, learning how to make explosives and bombs to disturb, confuse and force their belief on the rest of Nigerians,” he said. “Definitely, our security agencies have been tracking them for years and I believe that the operation we have launched now will be an operation that will contain them once and for all. Once the operation in Maiduguri is completed today, we are going to continue with the security surveillance all over the Northern states to fish out any remnants of these elements and deal with them squarely and promptly,” he added.